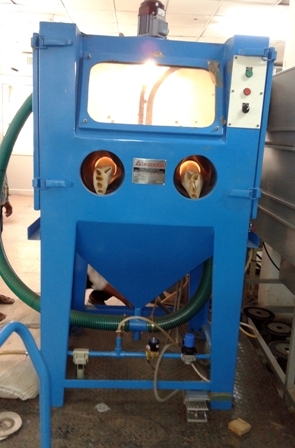 IPR has sand blasting machine (Model SB 9182) make of M/s. Abrablast. This medium size sand blasting machine works on induction – suction principle of abrasive delivery. Mostly of smaller and medium size job are used to clean to achieve fine matter finish. Material surface can also be roughened. The blaster machine has incorporated with reclaimer that ensure uniform cleaning and finishing each time and in every operation. This is achieved by an automatic abrasive cleaning system built into the reclaimer. The dust and debris are separated and only clean and sized abrasive are carried to blast ensuring a homogenous finish. Suitable size job holder can be used to restrict the movement of the job during the sand blasting inside the cabinet. In a quick time, the job surface can be cleaned even for very hard surface like tungsten materials can be roughened.